WIN one of two 6-packs of award winning estate grown wines from Tidswell! 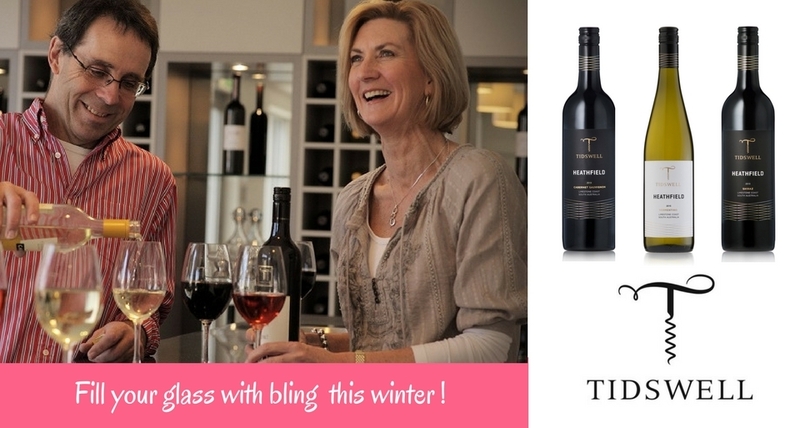 Win a wine pack from Tidswell Wines that will put some bling in your glass this winter! There are few things in life better than curling up with a glass of wine as the temperature outside begins to tumble. And one of the best things about winter approaching is knowing there will be more evenings ahead where we all get to warm up with our favourite wines! We have long been fans of Tidswell Wines, who produce boutique wines from their own vineyard estate in the heart of the Limestone Coast in South Australia. Their vines grow in the famous terra rossa soil of the area, and are nestled between pristine nature reserves in a relatively cool climate setting - which makes it ideal for growing premium red and white wine varietals. Since 1853, the Tidswell family have been enthusiastically filling people's glasses! They have five generations of publicans, tavern-keepers and winemakers gracing the family tree! For more than 20 years, Ben and Andrea Tidswell have continued this practice as winegrowers and winemakers instead of publicans, with each wine reflecting the people and places that have helped forge that tradition. Their Heathfield range of wines are some of the most award winning in their collection. And they want you to try them! So they're giving two lucky people the chance to win a pack of six Heathfield wines to try at home. Enter now for your chance to win a fabulous 6-pack from Tidswell's bling-worthy Heathfield range of estate-grown wines! HOW TO ENTER Simply answer one simple question below and then enter your details to go into the draw! Competition closes midnight AEST 5th June 2018. Please note: You must be an Australian resident aged 18+ years to enter. This promotion is in no way sponsored, endorsed or administered by, or associated with, Facebook. You are providing your information to The Fabulous Ladies' Wine Society & Tidswell Wines and not to Facebook. We hope you are the lucky winner. We'll announce the winner after the competition closes on 5 June 2018. Good luck! And don't forget to SHARE to get a bonus entry! Why not find out more about Tidswell Wines? Click here to find out why we think they are so fabulous. Share this now and get a bonus entry!